Yesterday was my 24th birthday, so I needed to do a manicure I would love, regardless of what some readers might think of it. I've always loved bright colors, and pastel shades of those colors hold a special place in my polished heart. 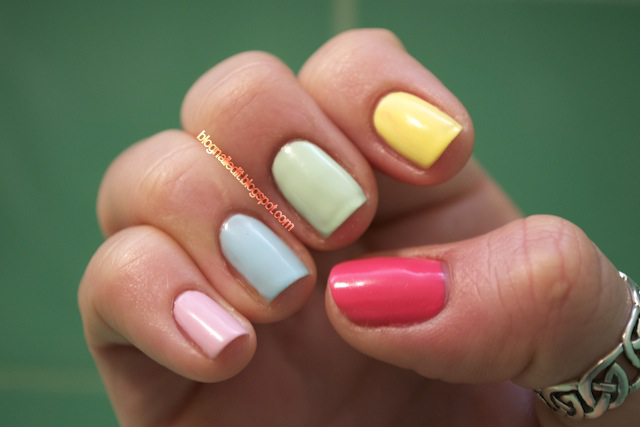 So I did a simple skittle manicure consisting of some of my new pastels from China Glaze's Up & Away collection. I love them all, but these won out, making a sweet little rainbow of colors on each hand. Just a sweet, simple little manicure I threw on before going out and getting a tasty breakfast with Andy. Later on I added black tips, but I didn't like the straightness of the tips enough to show you. I was too impatient to tape, so freehanded them. They don't look bad from far off, but up close they're not the best. @SadeeStyle Which country do you live in? @Ashesela Thank you! That's so sweet! I had an awesome birthday and the fun continues tonight! Happy Birthday!! You are only about 20 days younger than me. I turned 24 on the 1st of December. Was your birthday on the 22nd? That's my sister's bd too. @Mihaela (lacquerbuzz) It is indeed on the 22nd! Happy belated birthday to you too!